Involve your customers and collaborate with them from the start. Otherwise, you are working without understanding the whole picture. Sometimes called “participatory design,” human-centered design focuses on people’s everyday thinking, emotions, and behavior. It is a creative approach to problem-solving that involves the end-user from the very beginning and places them at the center of the digital design process. 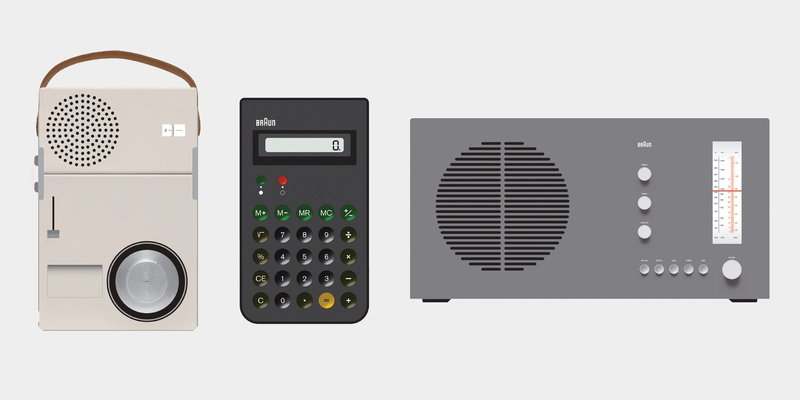 Design icon Dieter Rams is closely associated with the consumer products company Braun. His unobtrusive, human-centered design approach generated a timeless quality in his products. This is an important distinction for UX designers to make as by putting the customer first, and taking the time to understand their real needs, problems, desires, dreams and goals, a deep connection can be built that if nurtured, will be ongoing and lead to the creation of products that will solve people’s problems and help them lead easier, more productive lives. Ignited by the first and second industrial revolutions, the rapid growth of manufacturing gave rise to the need for mass-produced products expressly designed for human use. An abundance of fossil fuels, steam power, electricity and the innovative machines they powered set in motion an era of accelerated change that continues to transform human society today. 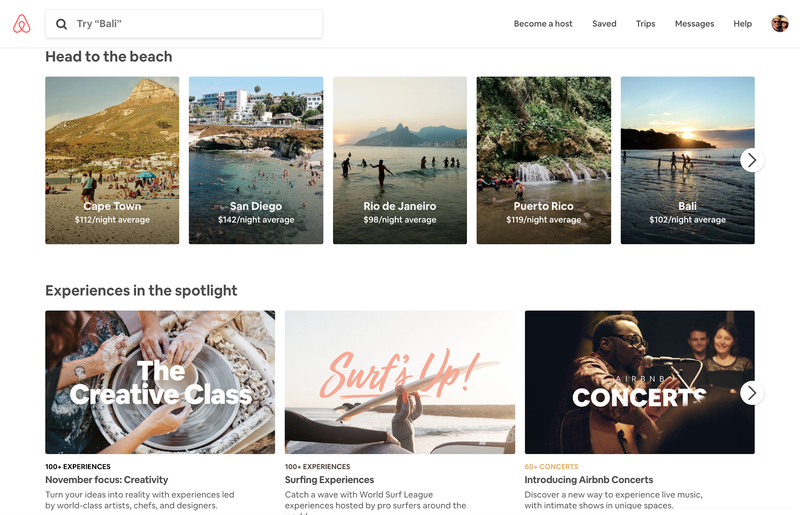 When designing their products, Airbnb employs a rigorous, human-centered design process. Modern industrial design was born after the second world war. The rising consumer culture fueled the need for everyday product designs that provided conveniences and worked well for people. Nevertheless, products designs were conceived, designed and manufactured without much end-user involvement and the process continued to be largely driven by star-designers, engineers and the conceptual ‘schools of thought’ (e.g. Bauhaus, Art Deco, Modernism, and Postmodernism) that arose during the late 19th and lasted until early 2001. Today’s typical product design methodology applying a human-centered design process ‘inverts’ the typical industrial age approach. With HCD, human beings are involved in the design of products and services right from the start. It’s a process where the end product is based on ‘human-centric design solutions’ to people’s problems, goals, and needs. The customer rarely buys what the business thinks it sells him. One reason for this is, of course, that nobody pays for a ‘product.’ What is paid for is satisfaction. But nobody can make or supply satisfaction as such—at best, only the means to attaining them can be sold and delivered. – Peter Drucker, the father of Modern Management Theory. Human-centered design builds upon participatory user research by moving beyond the participant’s involvement and producing solutions to problems. Initial stages usually revolve around immersion, observation, and contextual framing where UX designers become deeply involved with the problem and the community. The following stages focus on brainstorming, personas (representative users of the product), customer journey maps, prototyping and iterating on designs via continuous user-testing. Once the solution is integrated, the human-centered design process usually employs system usability scales and further user testing and feedback in order to determine the success of the solution. “By 2020, user experience will replace price and product as the key brand differentiator.“– Jonathan Beckman, Founder of Apptourage. The importance of applying a human-centered design process to product design cannot be underestimated. As well as potentially having an impact on a company’s bottom line, it leads to better products that solve real-world problems for people. Product teams and designers creating products in isolation without considering the people who are actually going to use them are doomed to fail. Failing to ask the right questions and not involving the end consumer from the start, is sure to result in a product’s failure in the marketplace. 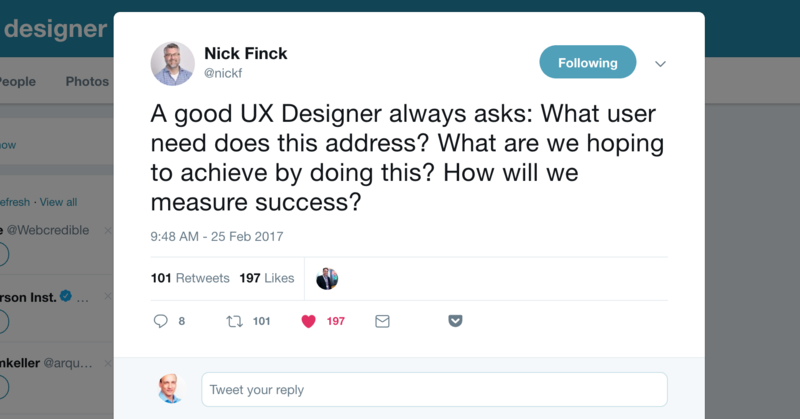 Great UX designers help teams and stakeholders make better decisions by using questions to identify opportunities, reveal underlying needs, and understand user context. As designers, we need to ask smart questions and be sure that everyone understands they come from genuine curiosity and a desire to explore the product design process more deeply, with the aim of coming up with the best design solution. Our mindset frames how we see the world. Central to the human-centered design approach is the adoption of a learner mindset; a learner is optimistic and seeks understanding as a way to guide their actions. Employing a human-centered design process, they built an interactive dressing room mirror that could display merchandise in different sizes and colors, make stylist recommendations for accessorizing a look, and more. Store tests were very successful, helping to triple expected clothing sales in Rebecca Minkoff stores. As the interactive fitting room project demonstrates, with close customer involvement, products are more likely to meet users’ expectations and requirements, which leads to an increase in sales and lower costs for customer services. An old UX adage says: “walk a mile in the user’s shoes.” When designers are in close contact with their customers a deeper sense of empathy emerges—essential to the creation of ethical designs that respect privacy and the quality of life. Focusing on all users of a product while applying the HCD process, designers are more likely to recognize the diversity of human values and cultures, a step in the right direction toward creating sustainable businesses. When done well, a human-centered approach fuels the creation of products that resonate more deeply with an audience, ultimately driving engagement and growth. As proof, we need to look no further than the recent success of design-driven companies like Warby Parker, Apple, Fab, and Airbnb. We’ve also recently seen big-players like Google, eBay and LinkedIn invest in the design of more integrated and sophisticated user experiences. Human-centered design starts from a place of not knowing what the solution to a given design challenge might be. Only by listening, thinking, building, and refining our way to an answer do we get something that will work for the people we’re trying to serve. Failure is an inherent part of the process because we’ll just never get it right on our first try. In fact, getting it right on the first try isn’t the point at all. The point is to put something out into the world and then use it to keep learning, keep asking, and keep testing. When human-centered designers get it right, it’s because they got it wrong first. In this saturated digital environment where people have become demanding and very savvy, applying human-centered design is pretty much mandatory in order to gain their trust quickly, ensure their loyalty and build brand recognition. More and more personal and professional business is conducted online, and users have come to expect an optimized, friction-free digital experience across all platforms and devices; when they visit a site or hit up an app, there are only seconds in which to engage them. In fact, first impressions are 94% design related. In our zeal to prove our design chops, sometimes we let our egos get in the way of the endgame—the satisfaction of our customers. It’s important to remember the “customer is king,” and that intuitive and easy to use systems and products developed while keeping this in mind are typically more successful commercially, and that in some areas (such as consumer products) customers will pay a premium for well-designed products. Human-centered design is about solving problems, not implementing solutions. It’s also about outcomes, measurable changes in customer behavior that are the indicators of success and value. The HCD process ensures that the right content, features, and functionality are presented in the right place, at the right time, in the right way, providing optimum user experiences, effortless interaction, and ultimately, business benefits. Why do we need human-centered design? With human-centered design, people are involved in the design of products and services right from the start. The human-centered design process ensures the product is based on human-centric design solutions to problems, provides optimum user experiences, effortless interaction, and ultimately, business benefits. Bill Moggridge was a British designer with a background in interaction design and one of the co-founders of IDEO. He designed the first ever laptop and was a pioneer in applying a human-centered design approach to designing objects and emerging technologies. 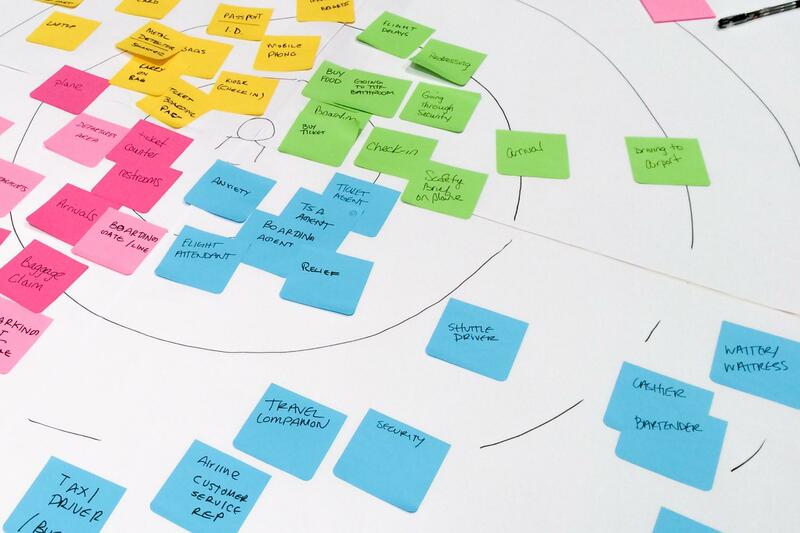 What does human-centered design mean? Human-centered design involves people right from the start and places them at the center of the problem-solving design process. HCD focuses on people’s problems, goals, needs, thinking, emotions and behavior in order to come up with effective design solutions to those problems. What is a human-centered approach? User-centered design is a process that usually includes research, empathizing with users, synthesizing findings, generating ideas, sketching, prototyping, and testing. You might see the term human-centered design (HCD) used interchangeably with user-centered design (UCD). A human-centered design is a good tool to convey the design among same minds. It makes the learning easy and this piece elaborate it very well. Such a great article. Thanks for sharing and keep writing.